Felix, Gurney's resident horticulture expert details how to plant a fruit tree. Learn the basics, including site preparation, planting depth and watering, and glean some expert tips in the process. Hi, Felix here with Gurney's, today we're going to be covering planting your fruit trees. Alright so step one here is to make sure that your planting site has no weeds or grass growing in it, just like we've prepped this one here, we have actually killed all the weeds and all the grass the year prior in the fall and this spring, we have a nice working area where there isn't any competition for our tree. That's step one, and then step two is you want to dig a nice hole. You also want to make sure your soil is nice and friable like we have here. It's not too wet, it's not clinging together, as you can see here we have crumbly soil. This could actually be just a little drier than it is right now, but we're getting rain here in a couple of days, and I want to make sure we get a nice watered-in tree for mother Nature. Alright, so we've done the hardest work, which is digging your hole and this soil is real nice so it was easy work for us. You can see, we have some dark, rich, nice, low soil. Again, it's a little wetter than you want, you can see this is sticking together, but it's workable, and if your soil isn't this good, you want to have some nice compost. We have a little bit of really nice leaf mold compost here and we're going to add just to add a little bit of nutritional and mycorrhizae activity into this planting hole. The other thing, you want to have your trees out in some sort of bag plastic bag so the roots can stay moist, that's an important point. So if it's a windy day or sunny and you're out working for a while, your roots don't dry out which can weaken your tree and set it back a little bit. So we have a nice hole here about 12 inches deep, maybe 14 inches deep. The depth of the hole depends a lot on how much of a root system you have. This is one of our trees here at Gurney's and we have our plant depth indicator. This happens to be a dwarf tree, so we have a dwarf root stock here and then a variety growth over, going off of it, where we've butted the variety. 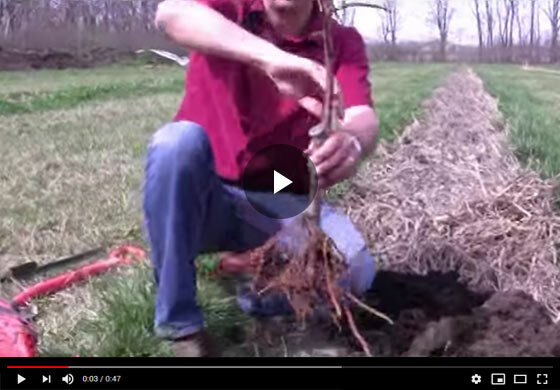 This is an important point here, because we don't want to plant this varietal bud below the soil line because it will actually root, and then you won't get the dwarfing effect from the tree. So this plant depth indicator is important, letting you know how deep to plant it and then the other thing in this case is, if you want, if you can plant that little dogleg here off the bridal bud into the westerly prevailing winds, that will give a little more integrity to your tree. So, plant depth indicator showing you want it about an inch below that, and then you can put your soil in. So when you put your soil in around the roots, you want to kinda make sure it's good and crumbly, so you don't have air pockets. I'll just put a layer of the actual soil around and then I'll add just a little bit of the leaf mold in there. Alright, so we've planted the tree here, put the soil around the roots, nice and loose, crumpled it around the root system. You'll notice our plant depth indicator is a little bit below the level of the soil, but when we water this in, all those air pockets are going to dissipate and we will be able to.. it'll settle up right around that plant depth indicator. We have a five gallon bucket here of water, just slowly water it in and you can see everything is settling in around those roots and that's what you want. Alright, so we've watered it in, depth is right at our plant depth indicator, we have a nice straight trunk, and that's all you need to do. One more step would be maybe a mulch around this tree to keep the moisture from evaporating as quickly. That's all there is to it folks, thanks for joining us at Gurney's.